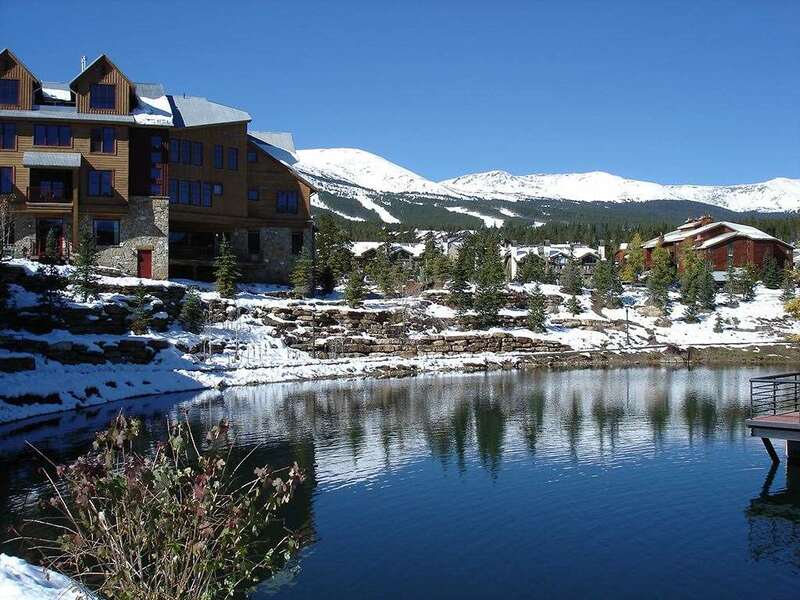 Breckenridge ski resort is an authentic old-west town with the atmospheric charm of the gold mining era combined with all the amenities, services and great après-ski of a first class modern ski resort. Like Keystone, Park City and Jackson Hole, the nightlife is very good for an American resort with a good selection of bars and discos which goes on until the early hours. The village supports more than 50 restaurants with the usual healthy American portions. The village is also justifiably proud of its local shops and amenities that are refreshingly clear of department and chain stores. There are also a number of art galleries that provide a diverse selection of fine, impressionist and abstract art. Breckenridge has over 2350 acres of serious terrain, receives over 300 inches of snow each year and has a peak of 13,000 feet. 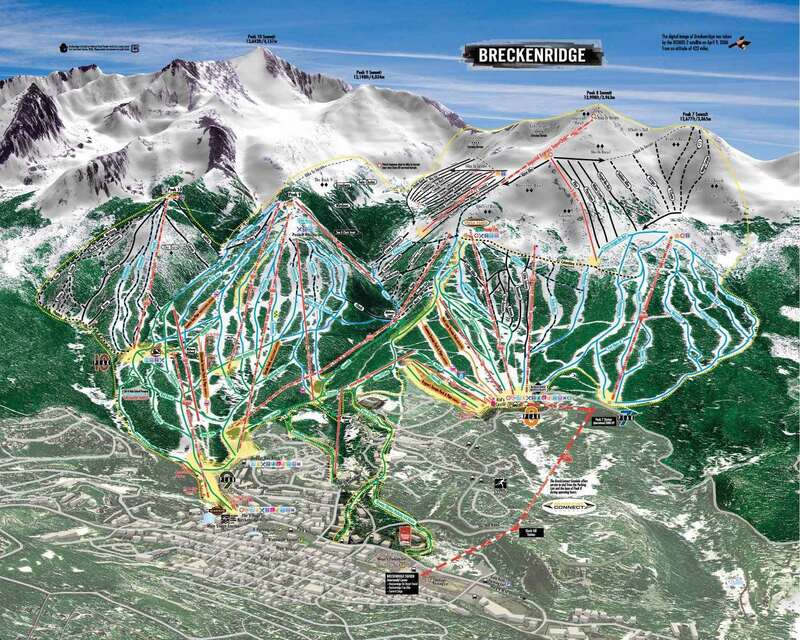 The Breckenridge ski resort area has received nearly $50m of investment in recent years producing well-manicured slopes, a quarter of which are cover by snow canons. The excellent friendly ski school offer beginners a great start. The gentle nursery slopes by the Quicksilver lift or at the base of Peak 8 will soon boost confidence to enjoy the abundance of easy green and blue runs. The highest resort in America with its huge, snow-sure ski area right behind the village is great choice for intermediates. Using the high speed Beaver Run chairlift, you will be negotiating Peak 9 in no time at all, and from there, the mountains open up for a tremendous skiing adventure across all 4 mountain peaks. With runs like ‘Psychopath’ and ‘Boneyard’ in the fantastic snow bowls of Peak 8, advanced skiers just keep coming back. The possibilities seem endless on the Ten Mile Range of Peaks 8, 9 and 10, with moguls (or bumps as the Americans call them) and double diamond black runs galore. The area has five state of the art terrain parks and four half pipes. If you like cruising there are plenty of turns to be had on well groomed pistes. Choose from our wide range of Breckenridge skiing holidays at www.igluski.com, or search through our Breckenridge ski deals to find the ideal ski holiday for you. The old mining town of Breckenridge is full of character and charm. The old Victorian Main street is lined with shops, restaurants and lively wild west bars. There is plenty of skiing for all abilities, with high speed lift system taking you to the US&#39;s highest skiing! A fantastic resort with something for everyone in terms of eating, drinking, listening to music or just shopping. Slopes are perfect for all ages and abilities with incredibly steep moguls as well as lovely long, very wide, sweeping runs. Snow parks are huge and have something for the timid beginner looking to practice jumping all the way up to hugely spectacular ramps only the insane would try. You realise you are in the highest resort in the USA as it really saps your energy and you may feel breathless the first day or two… (well my wife and I did and we are reasonable fit). A T-shirt I saw in one shop summed it up... "Breckenridge - my lungs hurt!"